Meet Ginny (L) and Carrie (R), the two lovely ladies who stayed with us this week. They are from the D.C. area, as Elliott and I are. I loved having two girls my own age around to talk to, especially when it came to books, Downton Abbey, music, movies... the things that 25-year-old girls talk about these days. Whether we work for a non-profit in D.C. or live in London or mother in Sicily, some things are always the same. On our trip to Syracuse, or Siracusa (as the Italians say), we first stopped at the archeological park on the outskirts of town. The first stop in the park was this overgrown Roman amphitheater, now turned brilliantly green in the lushness of Sicilian spring. 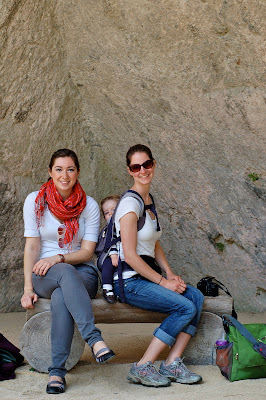 Later we turned in our tickets and walked into the main part of the park to see the three major sites: the Greek Theater, the Latomia del Paradiso (a sunken garden in an ancient quarry), and the Ear of Dionysius. We walked down into the "sunken garden" in the ancient quarry. It was a magical place, somewhat overgrown and Secret Garden-esque, with trees dripping with lemons and oranges. 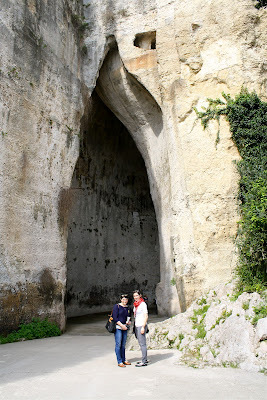 We found the Ear of Dionysius, a huge cave in the limestone quarry. 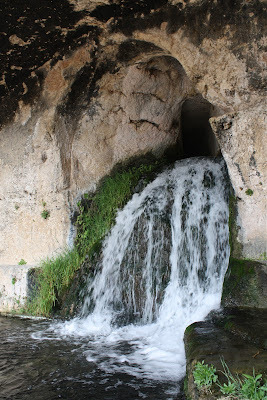 Legend has it that the tyrant Dionysius I of Syracuse housed political prisoners in the cave. The incredible acoustics of the cave allowed him to listen in to his prisoners' secrets. We spent some more time wandering through the gardens and admiring various locals soaking in the peaceful day. Meanwhile, hoards of tourists (about five school groups of Italian teenagers and seemingly endless cruise ship crowds all speaking German) filled the archeological park, and after awhile we'd had enough. We headed out of the sunlit grotto and wound our way towards Ortygia, the rustic town on an island just off the coast of Sicily. More photos from there tomorrow!